Free Expedited Shipping by DHL express, get your order within 3-7days. Aiming to offer better shopping experience, for this products, we will deliver your order by DHL express, so you can get it within 3-7days. Please choose Expedited Shipping when checkout. DSMART is an innovative brand who focus on developing smart wearable devices for your daily use, make your life more convenient and healthy. Hybrid samrtwatches integrate traditional watch and smart technologies, has longer working time comparing with common smartwatch, more conveneient and practical for daily use. Along with sports tracking, healthy monitor and managing functions to help you to improve your healthy. 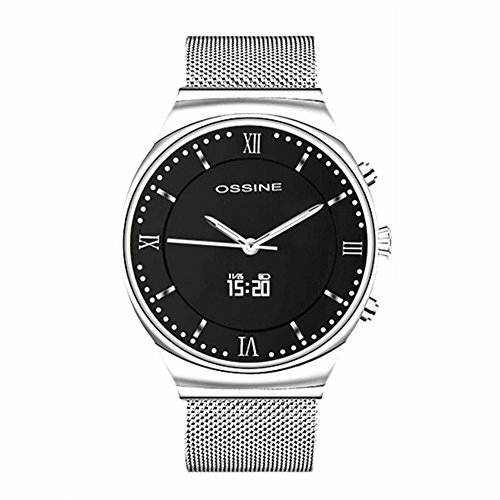 OSSINE X7 Hybrid Smartwatch are developped together by DSMART and OSSINE (which is a Swiss traditonal watch brand). Watch size: Dia 1.63inch (41.5mm), Thickness: 0.49inch (12.5mm). Motor: Built-in, reminder with vibration. Battery: 55mAh Polymer battery rechargeable battery. Compatibility: Smartphones IOS 8.0 and above, Android 4.4 and above. Satisfaction Guarantee: 30 days money back, 1 year quality guarantee. Thanks for starting your smart live with DSMART. Please feel free to contact us if you have any inquires! 【Luxury as classical watch】 - Ware it as classical and traditional watch with Swiss quartz movement, 316 stainless steel hand-crafted shell, Durable & anti-scratch sapphire glass screen, comfortable Milanese Magnectic steel straps, 5ATM waterproof (50m), meanwhile combined innovative smart technology. Elegant design, perfect gift for the gentlemen. 【Innovative Smart Technologies】 - Simply press a button to activate the smart functions. The hidden LED screen will show up with Heart rate monitor, Blood pressure, Blood oxygen rate, Sleep Monitor, Sedentary remind, Pedometer etc. All the date will be managed and record by the professional App "osi watch" , which is available for both Andriod & IOS devices. Perfect for daily healthy tracking, monitor, help you improve health and achieve fitness goal. 【Hybrid & Long Battery Life】 - Smartwatch can work 7 - 30days basing on usage.Say goodbye to frequent charing. The quartz movement can work for 2 years powered by traditional button battery which is also replaceable. And the smart funcitons are powered by rechargeable Polymer battery. For charging, with the up-to-date wireless charging tech., you just need to place the watch on charing pad. Much more convenient and easier to use than the common smart watch. 【Bluetooth 4.0 & Message Notifications】 - Connects with your smartphones within max.33feet (10meter) in seconds via bluetooth 4.0 technology . Time syncs and get notification of calls , SMS , app push ( like Facebook , Twitter , WhatsApp and Skype ) by buzz and vibration. You will never miss any important information, as well as Anti-loss & Stolen functions for phone. 【Free Expedited Shipping by DHL express】For this product, we will deliver your order by DHL express, so you can get it within 3-7days. Please choose Expedited Shipping when checkout. If you have any questions about this product by DSMART, contact us by completing and submitting the form below. If you are looking for a specif part number, please include it with your message.